KOM Consultants are the official Canadian representative for Griffith University in Australia. Canadian applications to Griffith University’s Transfer Degrees from Canadian Colleges are submitted directly through KOM Consultants 1-877-318-8203 or info@komconsultants.com. Nathan is the original Griffith University campus. With more than 13,900 students and situated in tranquil, native bushland on the edge of Toohey Forest, Nathan campus is a short walk or bus ride from our Mt Gravatt campus or a 10 minute drive from central Brisbane. Public transport connects the campus to Mt Gravatt, Garden City shopping centre and the Brisbane Central Business District CBD. The option to live on campus in six residential colleges, offering both fully-catered and self-catered accommodation appeals to many students. Students enjoy relaxing in campus cafes and bars, and have access to a bookshop, a general store, a post office, a computer shop, and banking and sporting facilities including a gym, squash courts, tennis courts and playing fields. Students can also access welfare, counselling and other support services. A post office, newsagency, hairdressing and beauty salon, co-op bookshop, a food co-op, STA Travel outlet, general store, medical centre, child care centre and numerous ATM’s are all on hand at the Nathan campus. 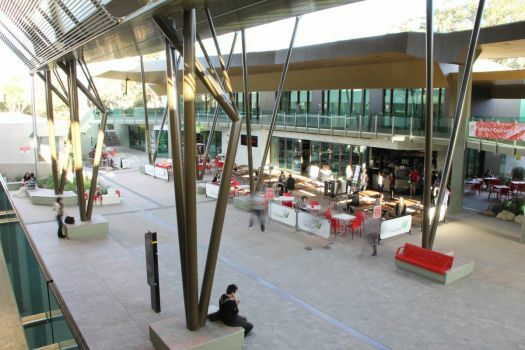 Students are spoilt for choice on Nathan campus with seven unique dining experiences to choose from. Here you will find everything from burgers and fries through to healthy salads and sandwiches and restaurant style dining. Facilities at the Nathan Library include a Research Zone, Collaboration Zone, DVD Lounge, Quiet Study Zone, Silent Study Zone and Laptop Lounge. Another prime study spot is The Goanna Lounge. If fitness is your thing, then you will feel right at home on the Nathan campus. There’s the fully equipped Fitness 485 gym and The Boxing Shop as well as a plenty of team sports to fulfil your sporting and social needs. If you need to unwind after class, you can head to the Uni Bar and Function room for a game of pool or a relaxing beverage in the company of Kookaburras. Griffith University provides a comprehensive range of services for all students on all campuses. Services provided includes accommodation, chaplaincy, child care, counselling, medical services and career and employment services.